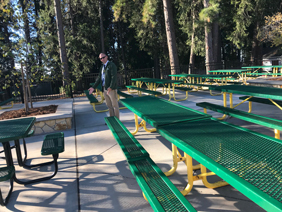 Superintendent/Principal Matt Smith at the new outdoor lunch area with new picnic tables and cement tree boxes. 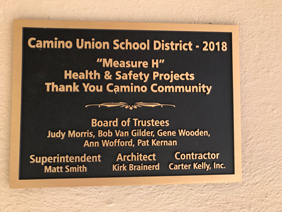 The Camino Union School District was transformed after School Bond Measure H provided funding for a massive renovation project that took place this summer. In 2016, the community overwhelmingly supported the $4 million bond with 71% of the vote and provided the resources needed to enhance the campus which was built in 1952. As you walk onto campus, the first thing you notice is the bus yard was leveled and moved for contractors to expand the school’s main parking and drop off areas. The parking lot and drop off locations are divided by a fence with a designated crossing zone to streamline traffic and increase safety. Kindergarten parents now make use of their new drop-off area and gates close to the classrooms. 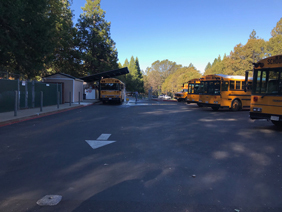 On the lower, middle school campus, the bus yard is nestled next to the mechanic’s shop and includes a canopy to cover buses as they are washed. Elevated exterior lighting and guardrails now outline the outside corridors. Student and staff bathrooms were completely redone, and new waterlines now separate irrigation from domestic lines to decrease the risk of contamination and regulate pressure. Water shut off valves and new septic lines, also provide safeguards. Two stormwater capture ponds were created to divert runoff into Webber Creek. Camino Polytechnic Charter School science classes are partnering with Ag in the Classroom and the County Water Agency to incorporate watershed studies into their lessons complete with research from the project engineers and tools such as rain gauges. New canopy to cover buses as they are washed. “The completion of this project is a testament to Superintendent/Principal Smith’s leadership, the commitment of everyone involved, and the generosity of this dedicated community,” County Superintendent of Schools, Dr. Ed Manansala, noted. For more information about Camino Union School District Schools, and enrollment.